Etymology - From Ancient Greek πολύγλωττος (poluglōttos, “many-tongued”), from πολύς (polus, “many”) + γλῶττα (glōtta, “tongue, language”) [Attic variant of γλῶσσα (glōssa)]. Adjective - 1. Versed in, or speaking, many languages; 2. Containing, or made up of, several languages. 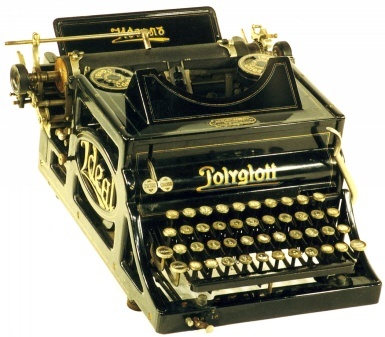 My post on the bilingual Erika Model 5 portable typewriter resulted in me receiving a very helpful email this morning from German typewriter collector Frank Werle. 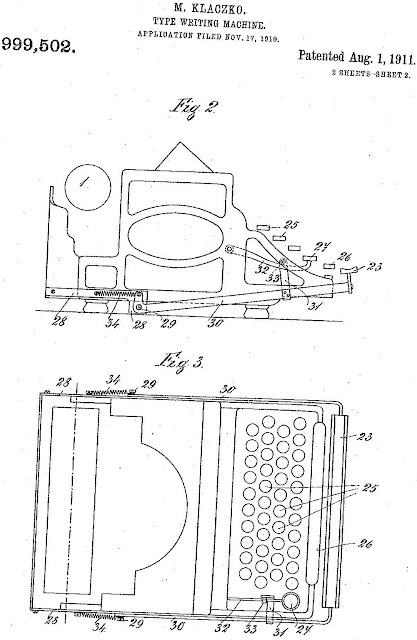 Frank’s detailed email enabled me to make the link between this unusual typewriter and Esperanto – through the typewriter’s inventor, Max Klaczko, who sponsored Esperanto in his native Latvia. “Having read your entry about the Erika 5 with Latin /Cyrillic keyboard, I thought that maybe I could contribute a few bits and pieces of information. 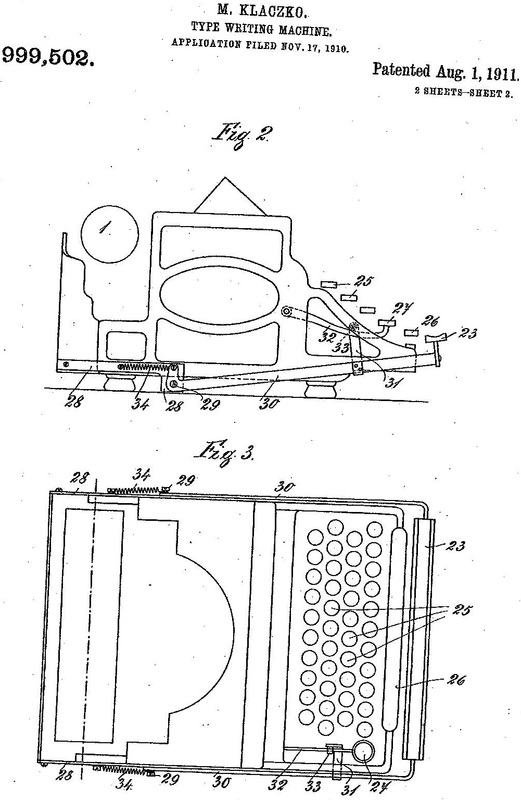 “Although I had not heard of the Erika 5 being built as a bilingual typewriter before, Seidel & Naumann were among the first manufacturers of bilingual typewriters, and to my knowledge the first ones that built a bilingual typebar machine, starting with the very first typewriter they made. 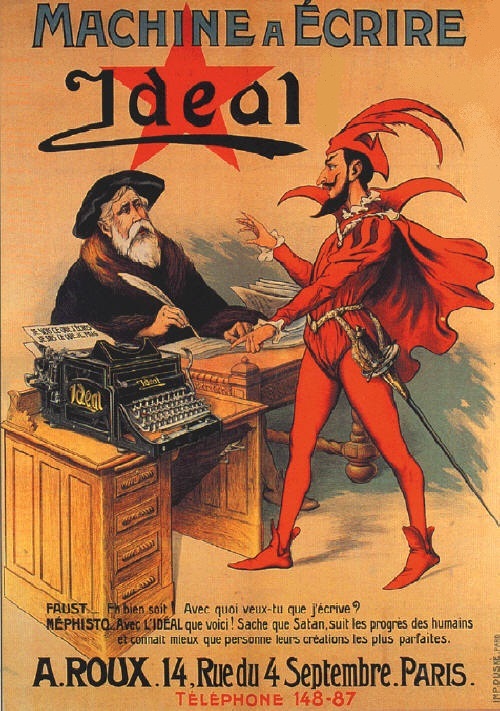 As you probably know, this was the Ideal A, which was also offered as the bilingual ‘Ideal Polyglott’. 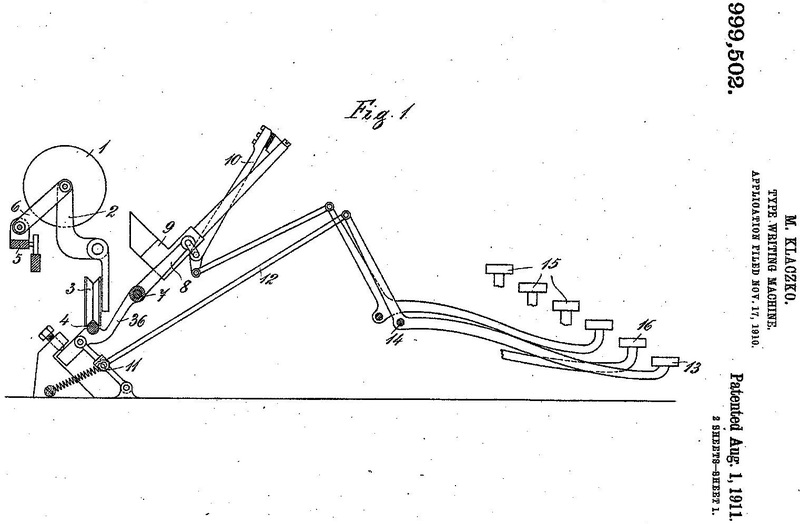 “The man who devised this machine was Max Klaczko, a chap with quite an interesting biography. 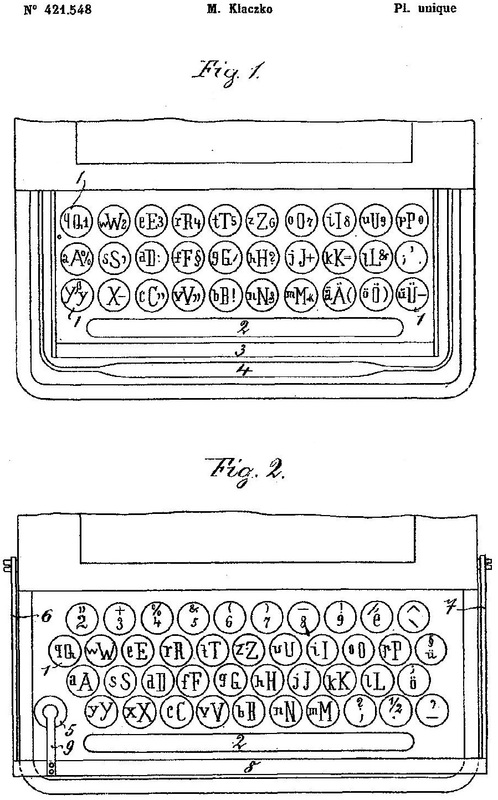 “I’ve attached my sources to this email, which are two different editions of Ernst Martin’s Die Schreibmaschine und ihre Entwicklungsgeschichte (The Typewriter and the History of its Development). 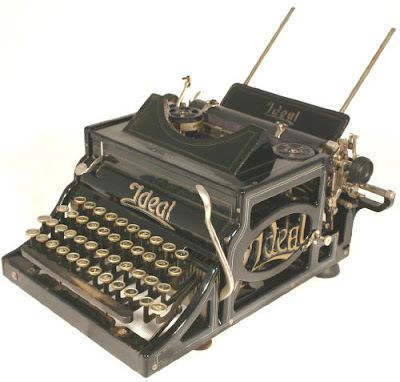 The scans include the articles about the Ideal typewriter and the paragraph about Klaczko. 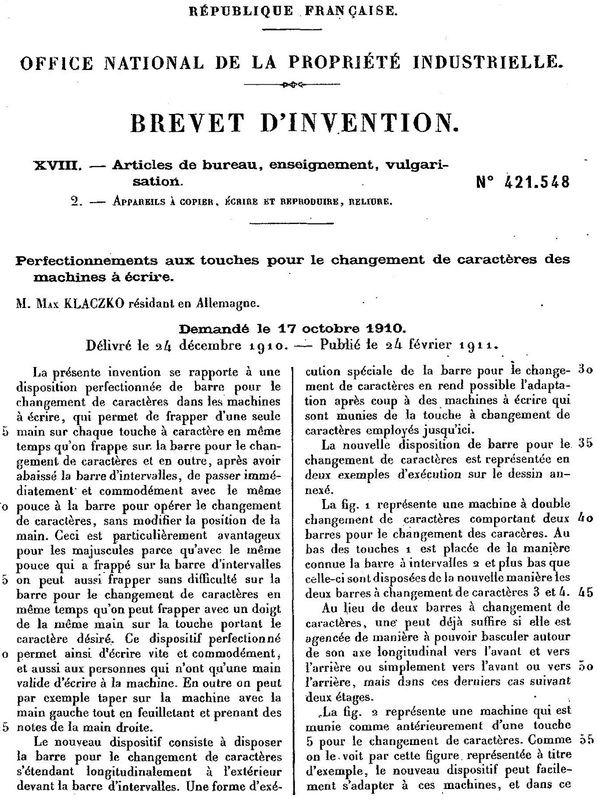 I’ve also included a (typewritten) translation of the part concerning the Ideal Polyglott in particular, and of Klaczko. Frank continues, “Another unusual feature I’ve noticed are the strange figs that are installed on your machine, for example the No. on the key of the 6. 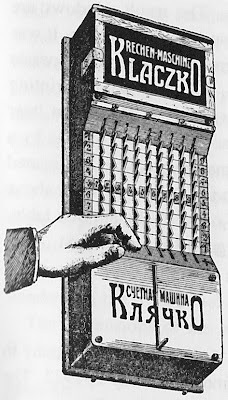 Additionally, the machine seems to be able to write more than one language using Cyrillic letters, as far as I can see, Russian as well as Ukrainian, Bulgarian and Rusyn might be possible. 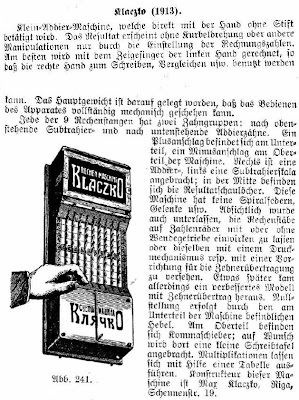 “Since Klaczko, as you’ll read in the attachment, was also very active in the keyboard design department, I suppose your machine features a Klaczko keyboard." 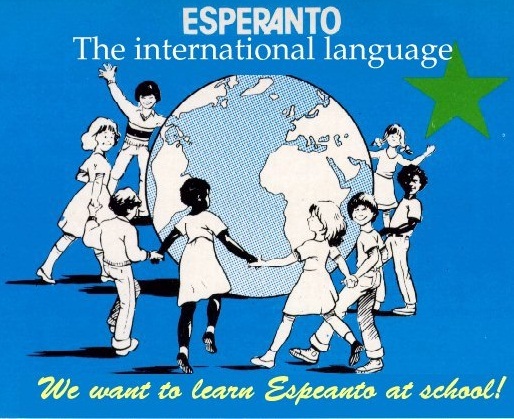 Next, let’s look at Esperanto, the most widely-spoken constructed international auxiliary language. 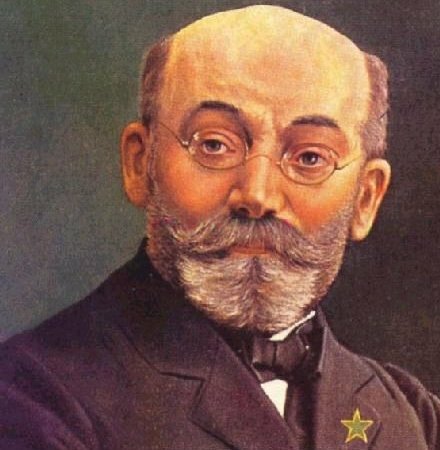 Its name derives from Doktoro Esperanto (Esperanto translates as "one who hopes"), the name under which Ludwig Lazarus Zamenhof (below), from Białystok in the then Russian Empire (now part of Poland), published the first book detailing Esperanto, the Unua Libro, in 1887. Zamenhof's goal was to create an easy-to-learn and politically neutral language that transcends nationality and would foster peace and international understanding between people with different regional and/or national languages. 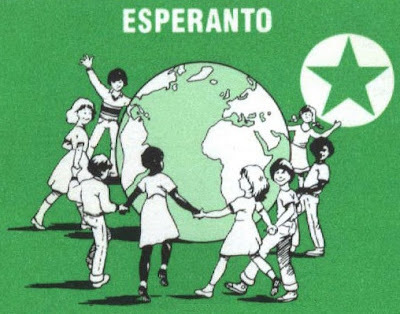 Vikipedio tells us, based on the Encyclopedia of Esperanto, that Klaczko sponsored the movement in Latvia. “Before the First World War Latvia belonged to Tsarist Russia … personal rights were limited. In the cities, many spoke three languages: Latvian, German and Russian. In addition, we studied in school English and French languages. 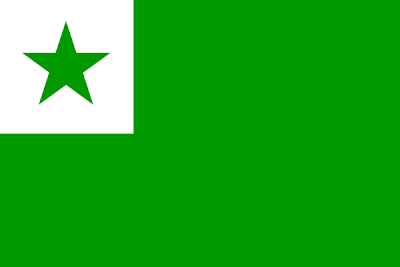 "In 1904 in Riga, a subsidiary of the Petersburg Esperanto Society ‘Hope’ was founded. At the time, the movement was greatly helped by Max Klaczko giving support and money." 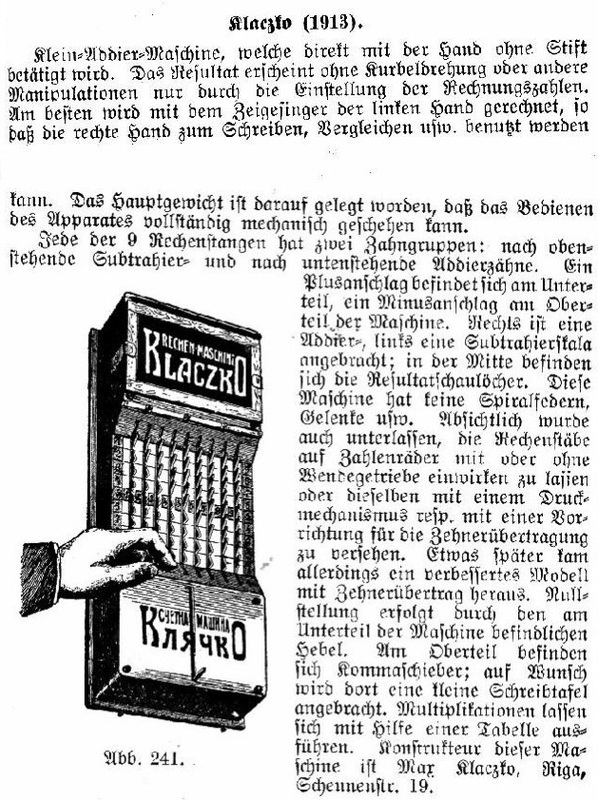 The family history continues, “Then he begun to improve commercial typewriting machines in order to make them usable bilingual, both in German and Russian, with their respective alphabets. In 1902 he patented this machine and begun to sell it. 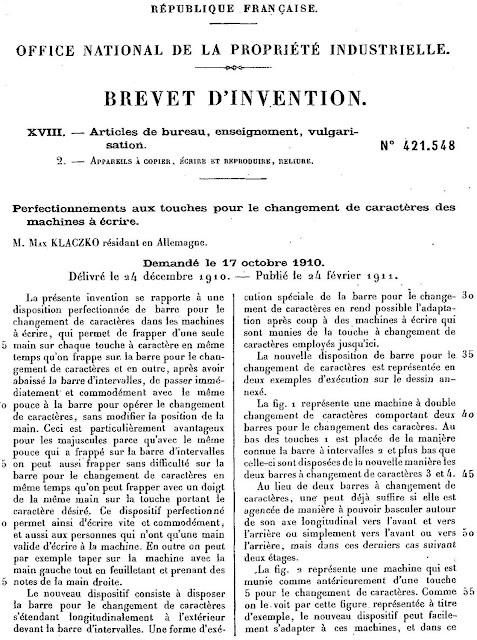 “A lot of following inventions made him known and in 1907 he was awarded a medal at the the Boston Exhibition and in 1908 at the World Exhibition in Brussels, as well as at the Business Machines Exhibition of 1908 in Berlin. 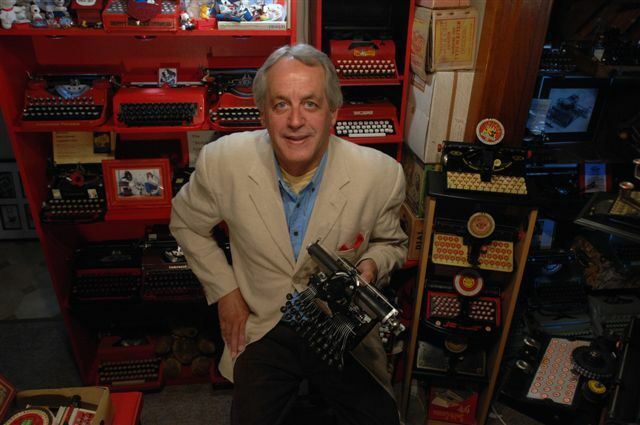 “He invented the additional typewriter options 'CTRL' and 'ALT' which IBM introduced 70 years later in its personal computers, and he succeeded in generating with 42 typewriter keys as much as 210 different signs, including at least two languages in one typewriter. “He also invented a switch to change the direction of writing from left-right to right-left, appropriate for Arab, Persian and Hebrew. 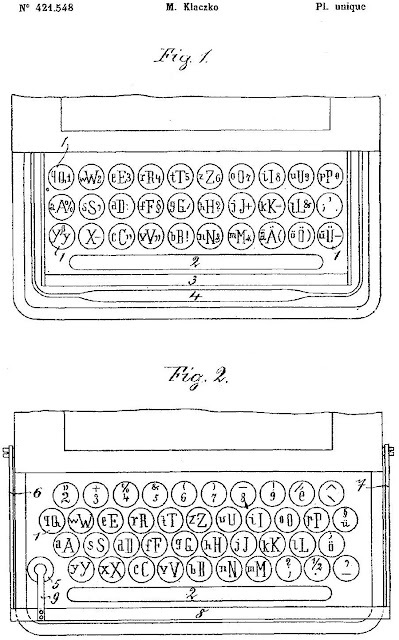 He also invented a exchangeable typing cylinder, much like the IBM electric typewriter of the 60s, in order to type texts in New Chinese, Japanese and other alphabets. “But his must astonishing success was the development of mechanical calculators, printing calculators, cash registering machines, mimeographing machines and other office equipment. Mi parolas malbonan esperanton. Great post, as usual. As always, your posts are jam-packed with fascinating tidbits of history and accompanying pictures and diagrams. But you may be surprised that the most interesting aspect of this particular post to me is that your German correspondent TYPED you an email. Do you get many of these, from typewriter enthusiasts? Thanks Robert. I really lack vocabulary in the languages I've tried. Cameron ought to be fluent in Solresol! 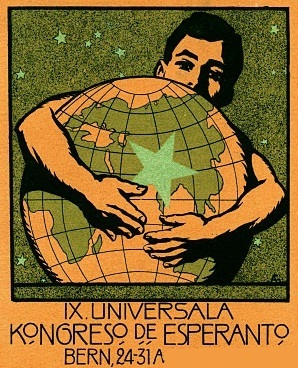 Just read in "La Esperantisto" from 1904 an Esperanto article about the coming Remington typewriter, which would support Esperanto-letters. Just read in The Esperantist (monthly magain prepared by B. Mudie) from 1904, that a Remington Typewriter will be there soon, which supports Esperanto letters. Have you ever heard about this fact? Did that plan ever came to reality?